Located on the banks of the Delaware River in Burlington County, NJ, Riverside is a historic small town with a population of around 8,000. It is actually the most densely populated municipality in Burlington County, which explains why individuals in Riverside Township are often arrested and charged for a variety of offenses including marijuana possession, possession of drug paraphernalia, DUI, harassment, simple assault, and criminal mischief. If you or a loved one is facing charges in Riverside, you likely have many questions about what to expect next. The most important thing to do after you are arrested or issued a traffic ticket in Riverside is to hire an experienced criminal defense lawyer to protect your rights. The criminal attorneys at our firm have extensive experience defending clients charged with disorderly persons offenses, indictable offenses, and municipal ordinance violations in the Township of Riverside and throughout Burlington County. If you have been charged with a crime or DWI in Riverside, contact our firm immediately at 609-832-3202 for a complete review of your case. We are happy to assist you and help you successfully navigate through this difficult and stressful process. Criminal Charges in Riverside Township: Where will my case be heard? After you are charged with an offense in Riverside, New Jersey, where your case will be heard depends on the type and degree of the charges against you. DWI charges and disorderly persons offenses like possession of 50 grams or less of marijuana, shoplifting goods valued at $200 or less, disorderly conduct, obstruction, trespassing, and municipal ordinance violations are heard by a municipal court judge in Riverside Municipal Court. More serious indictable offenses (first, second, third, and fourth degree crimes) are heard before a superior court judge and jury at the Burlington County Superior Court in Mount Holly. 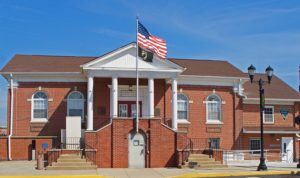 The Riverside Municipal Court is located at 1 West Scott Street in Riverside Township, NJ 08075. You can contact the court by phone at (856) 461-8820 ext. 2. Court hours are Monday through Friday from 9:00 am to 3:00 pm. Court sessions are held on the 1st three Tuesdays of the month. The presiding judge is Dennis P. McInerney and the court administrator is Marianne Ptaszenski. More information about Riverside Municipal Court is available on their website. If you need to contact the Riverside Police Department, located at 1 West Scott Street in Riverside, NJ 08075, you can call the station at (856) 461-8820 ext. 1 or non-emergency dispatch at (856) 461-3434. Call 9-11 if you have an emergency. For more information, visit the Riverside Police Department’s website. You can find more resources and information about the Township of Riverside here. Disorderly persons offenses in municipal court can carry penalties of up to 6 months in prison and heavy fines. With your freedom and liberty at stake, you should not hesitate to contact an experienced criminal and DWI defense lawyer who frequently appears in Riverside Municipal Court. To find you guilty, the prosecution must convince the municipal court judge that you committed every element of the offense beyond a reasonable doubt. If you were charged with a disorderly persons offense, your lawyer may be able to negotiate with the prosecutor in your case and get the charges against you downgraded to a charge that carries lighter penalties, or have the charges dismissed completely. Under New Jersey law, DWI charges cannot be downgraded, but they can be dismissed by having key evidence deemed inadmissible. To discuss your charges in Riverside with a knowledgeable criminal defense attorney who can explain your options, contact our local law office at 609-832-3202. Consultations are provided free of charge.